We are very pleased to offer a brand new addition to our fingerprint engraved wedding rings. 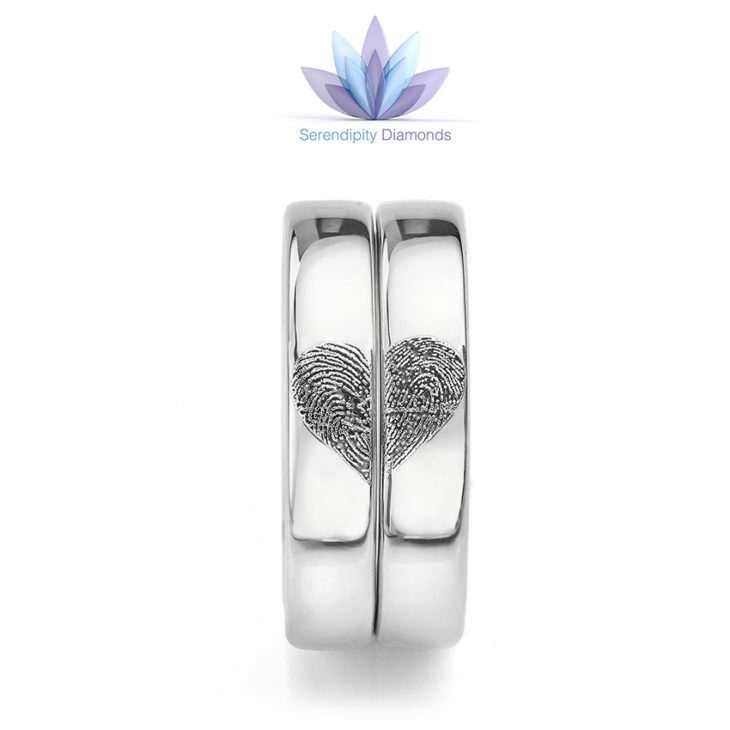 We have recently introduced heart fingerprint wedding rings. Each wedding ring is engraved with a partner’s fingerprint. We apply each print in position to create a heart shape when placed together. We capture your actual fingerprints. Using the latest in laser engraved technology we apply your very own fingerprints to the inside or outside of your wedding bands. We provide this service for most precious metals. This is by far the best way to create heart shaped wedding bands from simple plain ring designs. The style of wedding ring plays an important part in the heart effect when both rings are placed together. Ideally, wedding ring styles with a flatter edge produce best results. We recommend styles such as the Arreton edged court wedding ring design which is a perfect match for many engagement ring profiles. Choosing wedding rings with similar widths will also help, but don’t worry about equal finger sizes. The Groom’s wedding ring is most likely to be a larger finger size. We provide complete advice and guidance on how to create a pair of heart fingerprint wedding rings. 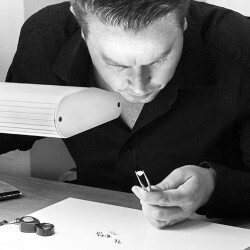 When you order your wedding rings, we send out a fingerprint engraving kit to take your prints. Once returned, we apply each print to the finished wedding rings, arranged to create the combined heart design as shown. 1. Choose your wedding ring design online. We recommend the Arreton or Culver ring designs. We also recommend 4mm minimum widths. 2. Select your metal, finger size and width. 3. Add customise with fingerprint option. 4. Continue shopping and repeat for the second ring. Upon confirmation of your order, contact us to request a heart shape across both rings. 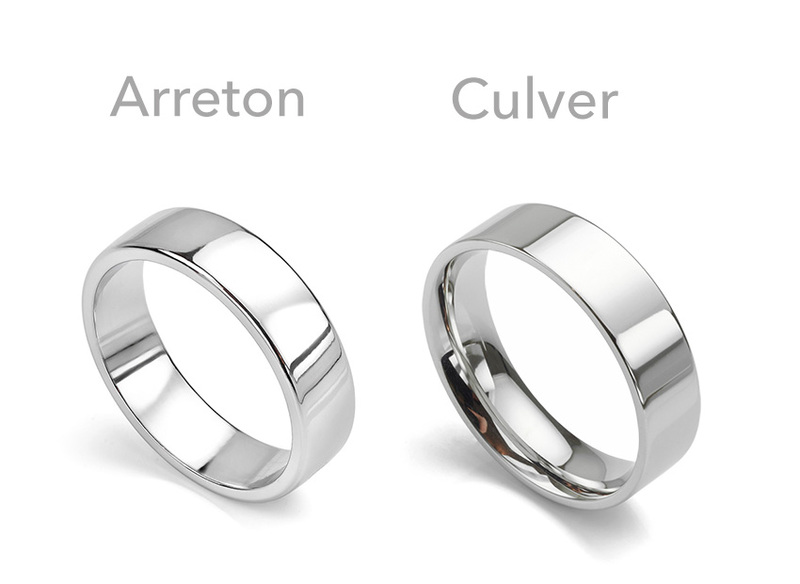 Arreton and Culver are both perfect wedding ring styles owing to the flat edge and flat surface for full effect when held together. Besides the basic cost of your wedding rings, two fingerprints applied in a heart formation will cost around £85 per ring—a small additional cost for unique personalisation. For more information, advice, and guidance, contact us today and our friendly team will talk you through each step towards the perfect pair of heart fingerprint engraved wedding rings.